Tourists visit MESCAL on one of the weekends when Frank Brown gives tours. Since 1913 over 126 movies and television shows have been filmed in Southern Arizona; from Oklahoma to McCLintock, to The Bottom of the Bottle. Movies and television shows provide an economic boost to southern Arizona as “the homeland of the Old West”. Baja Arizona continues to inspire film companies and continue to pick up movies like the recent Hangover III that was partially filmed in ‘Nogales. The Old West still lurks in these hills, perhaps the Old West Town of Mescal lies forgotten in the desert, but it is still celebrated in the Spirit of the Old West. Old Tucson Studios has set the pace in Southern Arizona for decades beginning in 1939 with “ARIZONA”‘ filmed at the studio. Dozens followed John Wayne, Glenn Ford, John Huston, Steve McQueen, Danny Glover, Clint Eastwood, and the Highwaymen, new generations followed, like Young Riders. In the 1960’s MESCAL was built originally for TV filming “The Young Riders” and Michael Landon’s “House on the Prairie”, but classics followed like Jose Wales, The Quick and the Dead, Stagecoach with the Highwaymen, Buffalo Soldiers with Danny Glover… For almost 20 years, Frank Brown has been the Sheriff in these parts. Frank is the sole resident of MESCAL except for Samantha, a stray black cat, that follows him everywhere. Frank is the caretaker of this slice of the Old West. He jokes and laughs about working with some of the greats in todays film making, Val Kilmer told him he regretted his “I’m your Huckleberry” line in Tombstone when facing down Johnny Ringo. Today he says, “No one ever comes up to me anymore and says Hello, It’s always, “I’m your Huckleberry”. Just for the record, there is no way that movie should have been called “TOMBSTONE”, it would have sold out as “DOC HOLIDAY”. Val Kilmer stole the whole show from Kurt Russell. We walk through the Saloon where EARP (Russel) walks into the bar and straight up to Billy Bob Thorton who is dealing cards and bad-mouthing everyone around. Earp back hands Billy-Bob a couple good licks and says “You gonna stand there and bleed or you gonna peel that smoke wagon”? Brown giggles to himself as we exchange lines from the scene and relive the moment. Franks loves this job. Brown is retired Military, been married six times and all of them got new houses and cars, and he paid for them all so he likes living alone, “I love being by himself”. He is on duty 24/7 week-in, week-out. Sometimes kids show up late expecting to party on the site and when I show up, and slide a shell into the shotgun, you can hear their assholes puckering. Brown hasn’t had much problem, he scares away someone, at least once a week. Sam the cat is nice and friendly but Frank has an allergy to cats and can’t pet her so she is always underfoot begging for the attention Frank can’t provide. Samantha showed up about two weeks after Henry, the mouser at Mescal for fourteen years disappeared, SAM has been there now for six years. As we wander through the streets Frank relates stories about each building and points to a staircase constructed for just one scene years ago, the OK Corral where the Earps went toe-to-toe with the Cowboys it is now a grassy lot. The Ghosts of Steve McQueen, Michael Landon and David Carradine linger along the Boot Hill built for the filming of TOMBSTONE. Just West of town stands the dead tree used in the movie “Maverick” where Mel Gibson is being hung on his horse and rattlesnakes are thrown at his horse’s feet. Tree in the opening of Maverick as Mel Gibson is being hanged is now anchored in cement. Brown originally found the tree in the Sonoita area and dragged it to the site for the filming, later in 2007 winds topping 70 mph knocked down the tree and 20 building on the Mescal site, each had been constructed for a scene or a movie in the past. The tree was resurrected by 3300 pounds of concrete, many of those twenty buildings still lie as stacks of lumber aging in the sun, just awaiting the next movie crew to blow in and start hammering away building something new. The Ballad of Cable Hogue. Scene of the Shoot Out at the OK Corral in Tombstone, starring Kurt Russell. AFTER 30 YEARS IN THE MILITARY FRANK TRIED TO RETIRE.TRIED FLY-FISHING BUT AFTER PROWLING EVERY COUNTRY IN THE WORLD AND EARNING 4 DEGREES, HE MOVED HOME TO THE DESERT. AS A TRAINED SNIPER HE LIKES TO WORK ALONE, “YOU’RE NOT A SPOOK ARE YOU”? “YEAH, I”M A SPOOK,” Brown said. “I would leave home for six months at a time, all my wife would get was a phone number she could call to see if I was okay! Frank is a little frustrated because his efforts to get MESCAL recorded as a historic park or memorial, have gone nowhere, mainly because nothing here is built to be permanent. Nothing but Frank Brown, who is permanent, Mescal has had four caretakers, the first was “Tex”, the second was “George”, then the couple, “Bill and Marlene”, and now, “Frank”, who says “you betcha” if asked if he wants to die there. He has a trailer, Old Tucson provides power, water and septic. He seldom leaves, he likes the peace and quiet, often thinks he was born too late in the last century. Frank takes pleasure preserving his small piece of the “Old West”. The Oklahoma Land Rush was filmed here and history will remember Mescal as the place where movies were made that glorified the Old West and opened a window to the world here before Statehood. Frank feels history all around him. He thinks his Dad and kin folk would be proud of the fact he wears a badge every day, he comes from a long line of Marshals, Sheriffs and Constables and Franks wants Mescal to last as long as he does. So they can just carry him over to Boot Hill and erect another cross to balance out that composition. Pool table Bill Paxton died on after being shot. According to Wikipedia Old Tucson Studios was built in 1938 by Columbia Pictures on a Pima County-owned site as a replica of 1860s Tucson for the movie Arizona, starring William Holden and Jean Arthur. Workers built more than 50 buildings in 40 days, many of those structures still stand. Ernest Borgnine yucks it up during the 1958 filming of “The Badlanders” at Old Tucson. The movie dealt with two men being released from the Arizona Territorial Prison at Yuma in 1898. Both want gold and revenge from a small mining town who imprisoned them unjustly. After the filming of Arizona was completed, the movie set lay quiet for several years, until the filming of The Bells of St. Mary’s (1945), starring Bing Crosby and Ingrid Bergman. Other early movies soon were filmed including The Last Round-Up (1947) with Gene Autry and Winchester ’73 (1950) with James Stewart and The Last Outpost with Ronald Reagan. The 1950s saw the filming of Gunfight at the O.K. Corral (1957), The Lone Ranger and the Lost City of Gold (1958), Cimarron (1959) and Rio Bravo (1959) among others. Robert Shelton holds a Winchester Centennial 30-30 rifle given to him by his friend John Wayne. 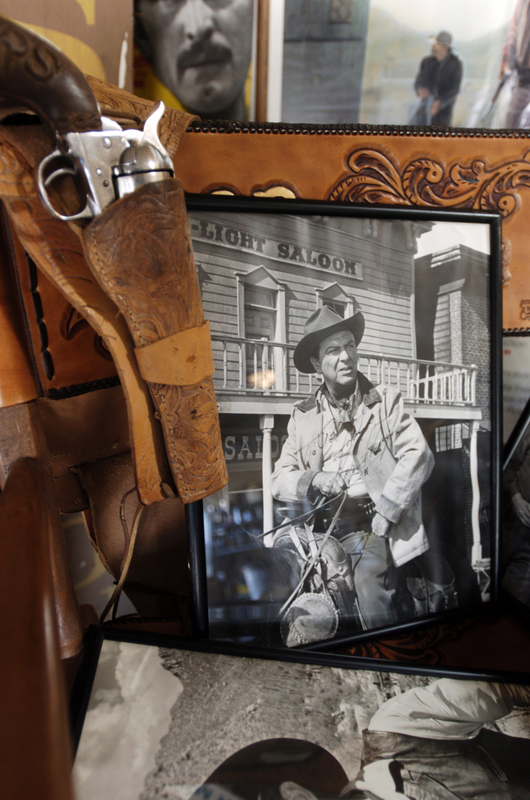 Among thousands of artifacts, photos and posters is a signed photo of Robert Taylor. In 1959, entrepreneur Robert Shelton leased the property from Pima County and began to restore the aging facility. Old Tucson Studios re-opened in 1960, as both a film studio and a theme park. The park grew building by building with each movie filmed on its dusty streets. John Wayne starred in four movies at Old Tucson Studios. Rio Bravo (1959) added a saloon, bank building and doctor’s office; McCLintock! (1963) added the McCLintock Hotel; El Dorado (1966) brought the storefronts on Front Street; and with Rio BRAVO (1970) came a cantina, a jail and a ranch house. In 1968 Old Tucson began adding tours, rides and shows for the entertainment of visitors, most notably gunfights staged in the “streets” by stunt performers, the 13,000 square foot soundstage was built to give Old Tucson Studios greater movie-making versatility. The first film to use the soundstage was Young Billy Young (1968), starring Robert Mitchum and Angie Dickinson. Michael Landon, left, sets up a scene with Moses Gunn, center, and Merlin Olsen, right, during the filming of an episode of “Father Murphy” at Old Tucson. This is the Tucson Citizen front page for April 25, 1995, when Old Tucson Studios burned. On April 25, 1995, a fire destroyed much of Old Tucson Studios. Twenty-five buildings, costumes and memorabilia were lost in the blaze, 100 pieces of fire equipment was deployed and over 200 firefighters from every fire department in the Tucson metro area, including Davis Monthan Air Force Base and the Arizona National Guard fought the wind-driven fire for four hours. The loss included all of Kansas Street and Front street to the wash on the east side, the corner store on the west, and the entire sound stage. The Mission area was destroyed along with the Mission, the Greer Garson house, and the cantina from Rio Bravo. Damages were estimated to be $15 million. Fortunately, there were no human or animal casualties. Old Tucson served as an ideal location for shooting scenes for TV series like NBC’s The High Chaparral (1967–1971) where the ranch house survived the 1995 fire: Little House on the Prairie, and later, Father Murphy, featuring Merlin Olsen and “Petrocelli”. Three Amigos was a popular comedy shot there in the 80s, using the church set. From 1989 to 1992 the show The Young Riders filmed at MESCAL Old Tucson’s sister site. The main street appears prominently in 1990s westerns such as Tombstone, a mirror set still exists at Mescal, AZ and is featured in The Quick and the Dead which filmed all of the town of Redemption scenes there. In 2013, Old Tucson and Mescal was featured in “A Hot Bath An’ A Stiff Drink”. DIRECTIONS TO MESCAL MOVIE SET: From Tucson, follow I-10 East. Take exit 297 for J-Six Ranch Rd towrd Mescal Rd. Turn left onto South J-Six Ranch Rd (signs for Mescal Rd). Continue onto N. Mescal Rd (dirt road). Turn left into drive. TOURS ARE $10 EACH. EXCEPT FOR TOURS DAY, MESCAL IS CLOSED TO VISITORS. Elsewhere in Arizona on June 1960 Apacheland Studios opened for business and filmed its first TV western, “Have Gun, Will Travel” in November 1960 and its first full length movie “The Purple Hills”. From the beginning as Superstition Mountain Enterprises in 1959 as Apacheland Studio until its demise in 2004 as Apacheland Movie Ranch, this historic Arizona landmark has seen Hollywood’s finest western actors walk the streets on Kings Ranch Road in Gold Canyon, Arizona. Actors such as Elvis Presley, Jason Robards, Stella Stevens, Ronald Reagan and Audie Murphy filmed western television shows and movies, such as Gambler II, Death Valley Days, Blind Justice, Charro!, Have Gun, Will Travel and The Ballad of Cable Hogue at the western movie studio for some or all of the filming. The last full length movie to be filmed was the 1994 HBO movie Blind Justice with Armand Assante, Elisabeth Shue and Jack Black. 2018 Old Tucson’s Mescal Movie Photo tours start February 17-18. The tours are every other weekend on Saturdays & Sundays. Tour cost is $10 per person. Tour times are: 9 a.m., 11 a.m., and 1 p.m. Appointment are unnecessary, just arrive at Mescal 10-15 minutes prior to tour time. PLEASE NOTE: There are no restrooms or other convenience facilities at Mescal. Please bring water and a hat. Directions to Mescal: From Tucson, follow I-10 east. Take exit 297 for J-Six Ranch Road toward Mescal Road. Turn left onto South J-Six Ranch Road (signs for Mescal Road). Continue onto North Mescal Road (dirt road). Turn left into driveway for Mescal. On May 26, 1969, fire destroyed most of the Movie ranch. Only 7 buildings survived. The sets were soon rebuilt but then almost 35 years later on February 14, 2004, 2 days after its 45th anniversary, another fire destroyed most of the Apacheland. On October 16, 2004 Apacheland closed its doors to the public permanently. The cause of both fires remain a mystery. All that remains of CATCH22 Beach in San Carlos Sonora where the satirical movie was filmed. The freestanding fireplace the center of the love nest shared by Barbara Streisand and Kris Kristoferson in the Sonoita area. It stood for years as a testimony to the Power of Rock and Roll but one night it was torched and burned from the face of the earth by daybreak. Exterior of the Love nest filmed in the making of A Star is Born near Sonoita, Az. CLICK HERE FOR A LIST OF MOVIE BY CITY IN ARIZONA…. This entry was posted on May 21, 2014 by PK WEIS. It was filed under Uncategorized and was tagged with MESCAL, Old Tucson, Old Tucson Studios. Maureen O’Dowd? The hell it is! That’s the beautiful Ms O’Hara! Any tour dates for March, April or May 2015? There are no restrooms or other convenience facilities at Mescal. Please bring water and a hat. Directions to Mescal: From Tucson, follow I-10 East. Take exit 297 for J-Six Ranch Rd toward Mescal Rd. Turn left onto South J-Six Ranch Rd (signs for Mescal Rd). Continue onto N. Mescal Rd (dirt road). Turn left into driveway for Mescal. I wish we could still tour the site. It is an interesting part of western history. 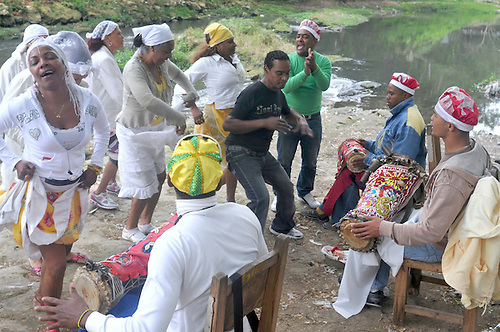 TOURS of MESCAL are on going…. Tell FRANK I SAID, HEY!